While the Pradhan Mantri Awas Yojana (PMAY) has been expanded to include even the middle classes, little is being done to resolve the issue of homelessness. 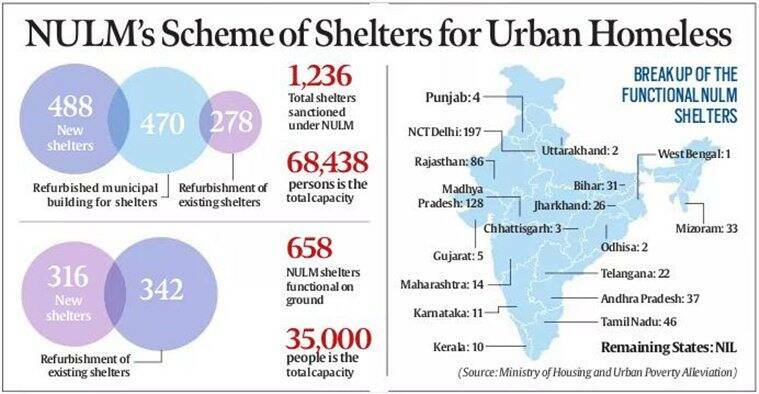 According to the latest official data, merely 658 shelters have been created since the launch of the Shelter for Homeless programme under the National Urban Livelihood Mission (NULM) in 2013. Of these a majority —342—are existing shelters that were refurbished under the scheme while the total number of new shelters constructed are 316. These 658 existing shelters across the country caters to a total homeless population of 35,000, which does not even amount to five percent of the total urban homeless population of 9.38 lakh (Census 2011). This census figures on homelessness — that enumerate those living in a structure without a roof — itself is a gross-underestimate owing largely to their invisibility. Civil society groups peg the extent of homelessness at one per cent of the urban population i.e. 30 lakh people which is thrice the census figures. The low census count is attributed to the difficulties of counting those without a permanent abode or the fact that the census data on homelessness excludes those such as construction labourers who sleep where they work. The 658 shelters, both new and refurbished old ones, are only in18 states. Of these, states such as West Bengal, Uttarakhand, Punjab, Odisha, Gujarat and Chhattisgarh hold a poor record of creating between one to five shelters each. The maximum number of shelters — about 197 — are in Delhi. The capital city’s comparatively better record is also the direct result of the Supreme Court pulling up the state government in the wake of the mounting homeless deaths in the winter of 2009-10. 14 shelters. The record for Uttar Pradesh shows that not a single new shelter has been built or existing one renovated under NULM in the state. “Mumbai has been the biggest defaulter and has been citing the lack of land as the reason for not providing any new shelters for the homeless. There is also the underlying prejudice that looks at the homeless as migrants who need not be provided for,” said human rights activist Harsh Mander, who as the Supreme Court commissioner, had prepared the National Report on Homelessness (2011) along with former Planning Commission member NC Saxena. The poor numbers on ground are matched by the meagre budgetary provisions made for the homeless as compared to housing for the relatively better-off segments. Following PM Modi new year’s eve announcement about extending PMAY to even the middle classes, Rs 1,000 crore was infused into the 2017-18 Union Budget for credit-linked subsidy scheme for the middle classes. The total budget available for constructing new houses under PMAY is over Rs 6,000 crore. On the other hand, Rs 349 crore is the total provision for entire the NULM of which Shelter for Homeless is just one of the seven components. Former Planning Commission member NC Saxena states that much-talked about PMAY excludes the poorest of the poor. “The interest subsidy was recently announced for loans up to 9 lakh and 12 lakh. Which homeless person can afford to buy a house or even get a home loan? What is needed are ample night shelters and cheap rental units for the homeless. This is how the entire world has dealt with the issue of homelessness but here the policies itself are flawed,” said Saxena. As per the norms laid down by the Supreme Court, there has to be one shelter with capacity for 100 persons or two shelters for 50 persons for every one lakh urban population. The SC Commissioner report dated December 31, 2011, had mandated compliance of these norms within a two-month period.